The Ñeta Association was founded by Carlos Torres Irriarte, also known as "La Sombra" ("The Shadow"). It began in the late 1970s when several pro-independence political prisoners were incarcerated in the Maximum Security Prison (see above​) called Oso Blanco located in Rio Piedras, Puerto Rico. They formed as a mutual protection group in the late 70's, ostensibly to improve living conditions and defend inmates from abuses committed by guards and other prisoners, as well as to fight the prison gang "G'27" ("Group 27"), or the "Insects" ("Insectos"). The G27s called the Ñeta​s "Worms" ("Gusanos"). In the early 1980s, the Ñetas became the most dominant gang in the Oso Blanco prison after fighting both opposing gangs and crooked correctional officers. 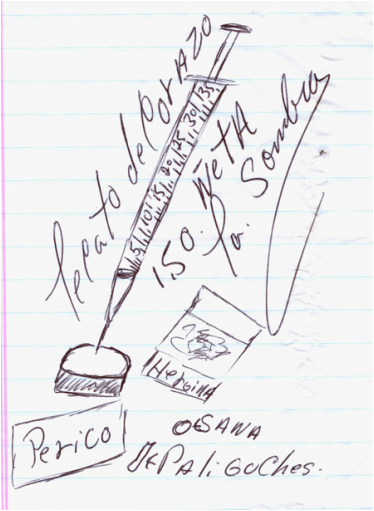 The majority of the inmates were fascinated by Irriarte's way of thinking and did all they could do for the Association. But the leader of the G27's - along with the help of paid-off authorities - plotted Irriarte's murder hoping to destabilize the Ñeta​. They were to ambush him when he left the watchful eyes of his followers on his routine walk to and from the prison chapel. On the afternoon of March 30, 1981, Irriarte, who was accompanied by an officer who was in on the plot, was attacked on his return from the chapel which was located just west of the Recreational Yard. He was stabbed in the chest, stomach and back and then shot in the abdomen by a .38 caliber pistol. He was pronounced dead sometime after sunset. During the investigation of the murder of Irriarte, the correctional authorities found that he was probably betrayed by his Lieutenants. His Lieutenants wanted to get into the business of drug trafficking in the prisons, but Irriarte opposed this. After the burial of their leader, the Ñeta exploded into an all-out rampage and took over several wings of the prison compound. Rumor has it that the majority of the Ñeta were drug addicts and in the drug trafficking business, so almost every riot would end with an assault on the prison's pharmacy where they took all types of narcotic medications. They first showed their power and brutal force when they retaliated against the G27's leader "Manota" in retaliation for the "Hit" he helped plan against Irriarte. After a few days of digging and chiseling their ways through the prison walls with spoons and their bare hands, they broke through the wall of Manotas' prison cell and stabbed him over 150 times and cut his body into 84 pieces. There were rumors that certain parts of his body were mailed to selected people: a severed finger to his mother; his ankle and foot were sent to the warden of the institution; and his eyes were sent to G27's second-in-command. The rest of his body was never recovered. The news soared and the media depicted the story as a hostile takeover. Used to their advantage, they used the media coverage as a means to send out messages to other members in different prisons across the island. Their message was clear: They wanted justice and they meant business. They warned the administration that if their demands about improving the living conditions within the facilities weren't met, there would be bloodshed and an all-out war. By the middle of 1984, their numbers multiplied excessively. They took over 7 major prison facilities across the island and ruled them with an iron fist. Today, they still control a good part of the prison system. They denounce and punish sexual offenders, pedophiles and abusers and exile them to solitary confinement where they do not allow them to interact with the rest of the prison population. It became such a force that the P.R.C.D physically segregated Ñeta and their rivals in separate buildings or facilities within the prisons. Reportedly in the late-80s, the association was involved in the cult of the "Holy Death" and performed several ritualistic murders at the Oso Blanco State Prison. In 1988 they branched out and expanded into the east coast of the United States and the forefront of Canada. There they broke their roots to Puerto Rico and continued to branch out as far as South Florida. Forming into separate Factions or "Chapters", they were built into an almost Mafia-like umbrella, where there was a President, Vice President and lower hierarchy instated. In the late 1990s, there were confirmed reports that Joanna Pimentel, known as "La Madrina," had been appointed council and leader of the New York City chapters. In 2001, Pimentel was convicted in a federal court in Brooklyn, New York, of ordering a gang-related killing in 1995 and was sentenced to life in prison. She is currently being held at the Federal Correctional Institution, Danbury, a federal prison in Connecticut. Their rivals vary throughout territories. Because of their structure they are usually in alliance with People Nation. Crips and Folks are usually on top of the list, as well as D.P (Dominican Power), D.D.P (Dominicans Don't Play), MS13, Los Sólidos, Grupo 31, and their lifelong sworn enemy G27 (Grupo 27). History shows that in certain areas of NYC they were even at war with the Latin Kings where the rivalry spread as far as Ecuador and Spain. Recent reports say the Ñeta have ended their problems with the Latin Kings and Bloods becoming allies around the New York City area. Reports also show the same for Spain, where the war between the Ñetas and Latin Kings claimed many lives in Madrid. One way to identify members of the Ñeta are by the beads they wear around their neck. Their rosary styled necklace usually embodies a cross and are worn with the colors white, black, red. Another way is their clothing: they wear mainly white or the colors of the Puerto Rican Flag (red, white and blue, where sometimes blue is replaced by black). A white bandanna is also a good way to identify members. It's usually represented as their "flag" They may also be identified by using the letters "ÑDC" ("Ñeta De Corazon" - Nyeta From The Heart). ACCESS THE FULL SECURED PROFILE BY BECOMING A MEMBER OF GFORCE BLACK. They use the facade of a cultural organization. They are establishing ties to street gangs. Their philosophy is "independence for the island" or "Puerto Rico." They see themselves as oppressed people who are unwillingly to be governed by the United States. Members are required to procure 20 prospective recruits. Any disrespect shown to an individual Ñeta member is looked upon as disrespect to the group and is usually dealt with violently. Ñeta members come together in observance of their fallen members on the 30th of each month. Identification: Members of the Ñeta align themselves with the Puerto Rican Independence movement led by Los Macheteros. Ñeta​ members are secretive and will not freely admit membership. This group is much more challenging to identify and validate than other gangs. 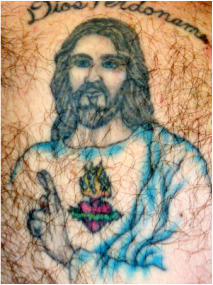 Emblem: Puerto Rican Flag, index and middle finger crossed, "1.50"(150% committed.) and the crossed machetes of Los Macheteros. Their colors are red, white, and blue. There is evidence that black is substituted for blue. Red is blood that was shed and prepared to shed. White is peace, harmony, tranquillity. Black is grief for those that lost their lives for Ñeta. These colors are usually worn with beads. This is not an exclusive form of displaying their colors. Members usually wear beads in these colors, but also will wear clothing such as bandannas, handkerchiefs sticking out of their pockets, white tops, black shorts, etc., in these colors. Probationary members wear all white beads until they are considered loyal; then, they can wear black beads among the white, plus one red one. Members usually display the Puerto Rican flag and are known to carry Ñeta identification cards. The Ñeta emblem is a heart pierced by two crossing Puerto Rican flags with a shackled right hand with the middle and index fingers crossed. 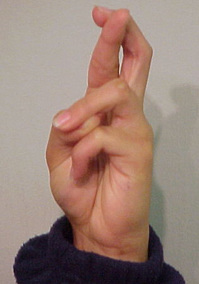 Members salute each other by holding the crossed fingers of their right hand over their heart. This hand signal means togetherness and unity. 30th of Each Month - Ñeta members come together in observance of their fallen members. March 30th - ​On the afternoon of March 30, 1981, Irriarte, who was accompanied by an officer who was in on the plot, was attacked on his return from the chapel which was located just west of the Recreational Yard. He was stabbed in the chest, stomach and back and then shot in the abdomen by a .38 caliber pistol. He was pronounced dead sometime after sunset. Prayer: In the name of our lord Jesus Christ and in memory of our maximum leader Carlos Torres, Iriarte, (also knows as) Carlos the shadow and all the brothers who fought in the struggle, may they reign in our minds and in our hearts forever and ever. Fight, Share, Progress and live in Peace and Harmony. FULL SECURED PROFILE | BECOME A MEMBER SUBSCRIBER OF GFORCE BLACK. Today, Ñeta Associations can be found throughout the prison systems of Puerto Rico, the United States, and Ontario. In 2009 they were reported as having up to 6,000 members in the North East Coast of the U.S. alone and to almost 13,000 in South America and thousands more worldwide. On June 3, 2003, seven leaders of the Ñeta Association were arrested in Long Island, New York for the stabbing and murder of two MS-13 members. On May 6, 2009, a Ñeta drug den was discovered and busted by the Drug Enforcement Administration, in the Queensbridge Housing Projects, located in Long Island City Queens. 156 Kilograms of Cocaine and 487 pounds of Marijuana were found in the apartment complex located on 41st Street And Vernon Blvd. 2009- Ñetas have been reported to have major conflict with former allies, The Bloods, and a more severe conflict with the MS-13 . 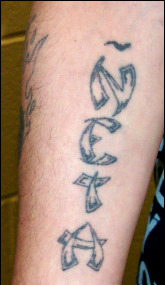 2010- Recent reports say Ñetas have been seen operating and connecting with the Bloods and Latin Kings.